If easy accuracy is what you desire, why take the time to use a pre-installed scale on a saw fence, or install your own scale, when the tool you use to start making measurements is the tape measure. 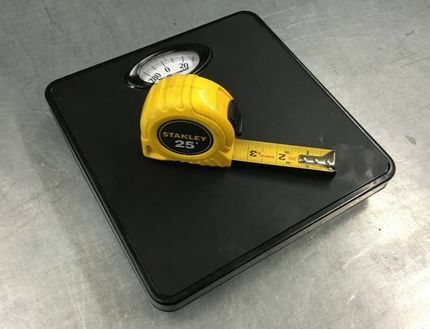 You wouldn’t take your scale off to measure dimensions away from your saw, so why add it into the mix? Consistency is king when accuracy is desired. To keep things consistent with minimal time and effort, one must keep it simple. Take dimensions for your cut list with your tape measure, then set your saw stops with the same tape, then double check the nicks, trim, and final cuts with the same tape. When you use this philosophy for accuracy and end up with unexpected results, one positive note is you will have fewer things to question when you ask what went wrong. A simple solution is a lot closer when you keep it consistent and keep it simple. Instead of feeling stumped, you can run down your procedure and double check your initial dimensions, double check your stops, and double check your material. When you use one measuring tool you don’t have to worry about tool calibration. How We Use A Saw to Cut Material 24"
Step 4: Measure the material to the nick. Step 6: Flip the material over and make a new nick and measure it, adjust if needed. At this point the Flip-Away Stop should be dialed in to the exact measurement we needed, true to the tape measure we are using while doing the job. There is no fuzz factor only the consistency of a single measuring tool.